Part 28 of the “Occupational Hazards” Story Arc. So after a 5-year hiatus, Sausage-Fest is back… but as Ghost Potato. Now you may be asking yourself (although, in reality, I doubt you care), “what happened?” Since the last real comic update, I’ve moved from Chicago to New York, went to graduate school for design, and have had my share of professional freelance and full-time jobs. With school done and the utter craziness that doing a thesis entails now over, I’ve found myself with a little more free time to work on my personal projects. Well, making comics has always had a little place in my heart. As such, I’m continuing from where I last left off: in the midst of the “Occupational Hazards” storyline. In case you didn’t notice, I totally redesigned the site. The majority of the pages are complete and all the comics from the old site have been imported, and by utilizing what I’ve learned in grad school, my work experiences, and the sheer evolution of the internet, I’ve expanded the comic to some other social media platforms: you can find Ghost Potato material on Facebook and Instagram now. You know, I think you should follow those pages — but that’s just my suggestion. I’ll update weekly, every Friday. I’ve finished a few during the course of the past five years, and releasing a comic a week allows me to draw more as a hobby while still maintaining some kind of income. As far as the story and character development are concerned, I wanted to introduce Failure and Fortune’s super cool superpowers: they both can foresee the future; it’s just that Fortune can only see success and general good stuff, while Failure can only predict horrible outcomes and plain shittiness (hence their namesakes). 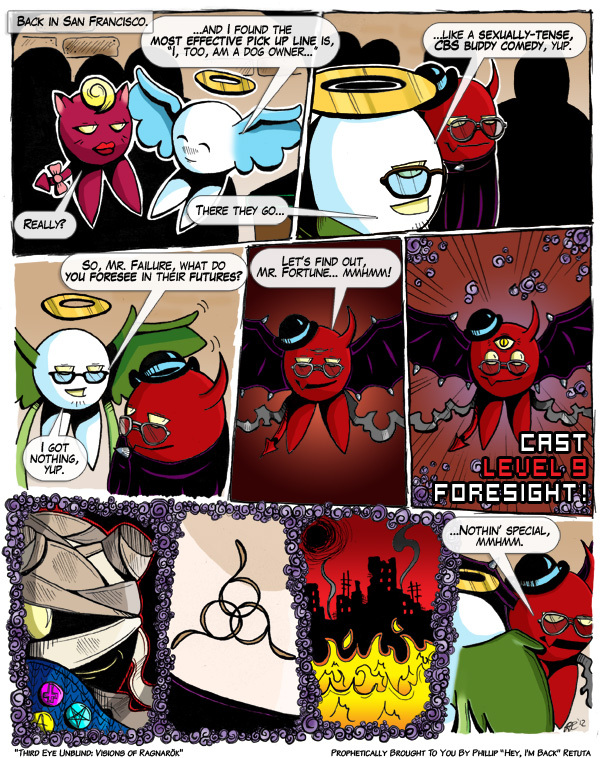 Today’s comic only serves as a foreshadowing of things to come, and as you can see, Failure and Fortune’s design (including the general theme of today’s comic) has been heavily influenced by pagan and occult imagery — but without going so far as calling myself a Satanist. With such foreshadowing in mind, the “Occupational Hazards” storyline is all planned out, with a slew of new characters and plot developments. Stay tuned, and I hope you enjoy the ride.